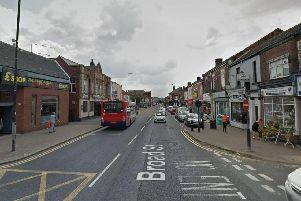 A motorist was caught at more than twice the drink-drive limit after he had left home after a row and crashed his van. David Hall, 57, of Ringwood View, Brimington, Chesterfield, lost control of his Volkswagen Caddy van on Crow Lane, at Chesterfield, and crashed before driving off and being stopped by police. Mrs Haslam added, during the hearing on October 18, that Hall registered 98 microgrammes of alcohol in 100 millilitres of breath when the legal limit is 35 microgrammes. Hall pleaded guilty to exceeding the alcohol drink-drive limit after the incident on September 26. Defence solicitor David Gittins told the hearing there had been an argument and he had left home and as he went around a bend he reached for some flowers he had bought and it caused a crash and his car was damaged. Mr Gittins revealed that Hall had lost a leg when he was 17 years-old in a motorcycle accident but this has not held him back. He added that Hall also has a disabled child but he and his wife have become skilled carers and also help other youngsters. Mr Gittins explained Hall never takes time for himself and this has led to arguments, depression and anxiety which culminated in the drink-driving matter. Magistrates sentenced Hall to a 12 month community order with 60 hours of unpaid work. He was also disqualified from driving for 16 months but this can be reduced if he completes a 17 week drink-drive rehabilitation course. He must also pay £85 costs and an £85 victim surcharge.